Yes, Johnny Depp acts like Michael Jackson. If that is all you wanted to know, then there you have it. Despite this strange departure from the classic Gene Wilder portrayal of Willy Wonka, the movie stands as a great source of entertainment on so many levels. I have never seen the original Willy Wonka and the Chocolate Factory, so my view of its latest treatment will be devoid of old school nostalgia. As you may know, the movie’s premise is quite simple: billionaire confectionist Willy Wonka goes into seclusion after he is betrayed by his employees and reemerges some years later with the enticing prospect of allowing 5 lucky people to visit his chocolate factory. 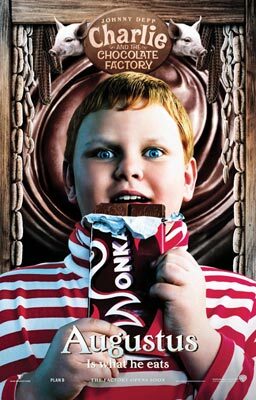 5 golden tickets are stashed away within the wrappings of 5 ordinary Wonka bars and 5 children wind up discovering them. One of these children is poor young Charlie Bucket (played by Freddie Highmore), a little goody-good with just the right optimistic attitude to make it through his fairly impovershed life. And so the movie begins. The movie delivers what you would expect from an end-of-summer release tooted as a summer movie: the visuals and cinematography are impressive, breathing a Disney-esque sense of wonder into Wonka’s chocolate factory. The music as well is Danny Elfman as his best, harking back to the goofy rhythms of Beetlejuice while setting foot into other genres during the Oompah Loompah scores. Oh, those Oompah Loompahs. If I were to pick one reason to justify the price of admission to see this movie, the Oompah Loompahs are most definitely it. Played individually by Deep Roy (yes, that is his name), the Oompah Loompahs are an ingenius use of digital and camera trickery and act as musical moralists during each of the children’s exit cues. Speaking of children, don’t let the presence of tykes dissuade you from seeing this movie: they’re not the annoying brats that one would expect to see in a movie such as this. The 5 children (with the exception of Charlie) act as dimunitive versions of every jerk, slob, and cynic that you may have known, whether in childhood or in your current state of growth. The casting of the movie is perfect. Charlie and the Chocolate Factory was a welcome end-of-summer dessert that is pleasantly enjoyable at any time, just like Wonka’s world-famous candy. This was one of those rare movies that left me feeling all warm and fuzzy inside. And I didn’t mind. It’s one of those movies that hooks you from the beginning and keeps you immersed in the experience all the way through. From the opening sequence where we see Willy Wonka’s chocolate being packaged in a wacky Rube Golburg device that’s entertaining, clever and appropriate, to that very last line of narration which sums up the movie so perfectly; the entire movie was just so very satisfying. Especially when all the kids start getting brutalized. Now that’s the best kind of way to get a warm and fuzzy-feeling. Depp’s “Come suckle my lolly pops, children” approach to the character of Wonka was…different, but with a purpose, as it shows just how out of touch with reality Wonka was (even if he did mirror a certain unscrupulous celebrity). And besides, Would you really want to see him trying to copy Wilder’s version of the character? And that’s one thing that made this version so great. It’s similar enough to the original to keep things recognizable all the way through, but different enough so as not to feel like you’ve seen it all before. It’s like watching the original movie through a different, perhaps darker, pair of glasses. And, if that didn’t peak your interest, you get to see what happened to all the kids AFTER they met their gruesome fates. Very…”surreal”. And it has that guy from the Neverending Story in it! You know!? The midget with the racing snail? Yeah, Deep Roy. Except this time he isn’t dubbed over by some guy from California. Oh, and there’s, like, 90 of him and they’re all skilled in interpretive dance. I think the only thing that bugged me about the movie were the Oompa Loomp songs. Elfman’s score was fantastic and eerie like all his others, but the Oompa Loomp songs were all just a tad lack-luster and forgettable. I know I shouldn’t be comparing them to the originals, but they just set the bar so high. I can’t say I remember the tunes to any of these new ones. The movie’s a B+ at worst and I’m hard-pressed to think of any reason why people (capable of differentiating between the old and new movies) wouldn’t enjoy the film on some level.